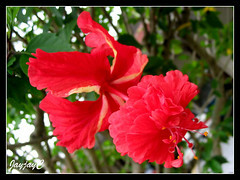 Hibiscus rosa-sinensis, the single form with the 5-petaled blood-red blooms, is Malaysia’s national flower. 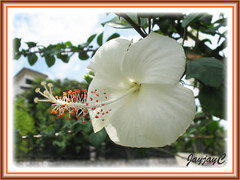 It is locally known as ‘Bunga Raya’ in the Malay language. Hence, it is no surprise that this spectacular ornamental shrub is popularly and abundantly grown in our country, especially along roads and highways, lending beauty to the landscape. 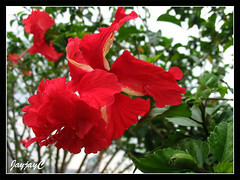 Widely seen is the original variety that is decorated with large and attractive red flowers which we have previously grown too. 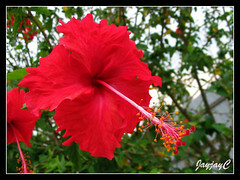 Very recently, I discovered a fascinating phenomenon on one of the Tropical Hibiscus bushes scattered around our church compound. This beautiful shrub, decorated with bright and vivid red flowers has certainly been around for ages but I have eyes that sometimes do not see? 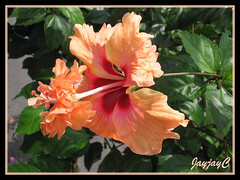 Upon close scrutiny, I noticed that it produces two kinds of bloom, one a single with 5 red and ruffled base petals (as in the topmost photo) and the other, a crested single with the same number of base petals but with whitish edges and having a cluster of extra petals (petaloids) extending from the top of the staminal column. Truly remarkable! Plant type: Perennial ornamental shrub, native to China and Southeast Asia, though widely grown throughout the tropics and subtropics. 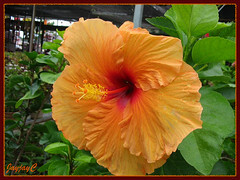 Features: Hibiscus rosa-sinensis is one of the popularly known species of the genus Hibiscus that comprises of about 250 species. 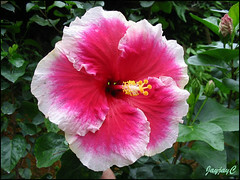 This tropical hibiscus species has about 6,000 registered named cultivars and varieties. 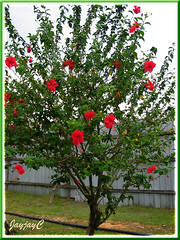 It is a fast growing evergreen perennial shrub or tree that can reach about 5 meters tall or more. Typically though, garden varieties are about 1-3 meters in height. Depending on the cultivar, growth habit may be dwarfish, tall and upright or sprawling. Foliage is mostly medium to dark green and glossy, in varying size, shape and texture. Leaves are broadly ovate or lanceolate, mostly with serrated or scalloped margins and sometimes lobed. Some cultivars have beautiful variegated leaves in green and speckled white and pink or red, such as ‘Cooperi’, ‘Snow Queen’ and ‘Hummer’s Fantasy’, to name a few. Flowers on the other hand varies extensively due to the thousands of cultivars and varieties that have been developed over the many centuries and still ongoing currently with increased momentum by hybridizers and hobbyists alike. Flower colors are splendidly varied, ranging from a single color or two to many dazzling combinations that are simply astonishing. Shades of color include probably all the colors that are listed in a color chart, ranging from white to pink and red, and from yellow to apricot and orange, to name a few. Unsure whether black and true blue are still excluded to-date. Bloom sizes range from miniature 7.6-12.7 cm (3-5 inches) to regular size up to 20 cm (8 inches), with some cultivars (hybrids) as large as 25 cm (10 inches) in diameter. Even the petal formation and textures are extremely varied. Blooms may be single (5 base petals), crested single (with an extended cluster of petaloids at the top of the staminal column besides the 5 base petals), double (extra petals besides the 5 base petals) or cup and saucer double (five base petals with petaloids sitting on it as a cup on a saucer). Petals can be narrow, rounded or broad, smooth or crinkled, simple or ruffled-edged, overlapped, flared or reflexed, with endless possibilities. A typical single bloom has 5 petals with a long central staminal tube bearing numerous stamens that surround the style and 5 stigma. Flowers are solitary in upper leaf axils. Though individual flowers that are mostly unscented last only a day, at most 2 days for a few cultivars, the plant produces them in constant succession throughout the year in warmer tropical regions, just perfect for sunny and bright locations. 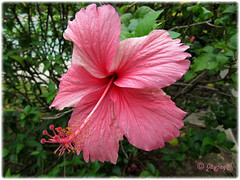 Read here to know how incredibly varied the features of Tropical Hibiscus are! 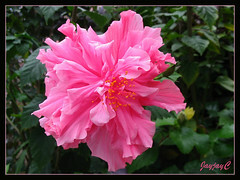 Culture (Care): Mimic the natural conditions of plentiful sunshine, humidity and rainfall in the tropical regions where it originated, and Hibiscus rosa-sinensis will reward you generously with luxuriant growth and non-stop flowering year round. Light: Full sun (hours not too long though, preferably 2-3 hours of morning sun) and heat. Best growth and flowering in hot, humid and wet environment. Moisture: Water regularly, and more especially during very hot and dry seasons. Water less during cool and rainy weather. Soil: Prefers organic-enriched, moist and a very well-drained soil. Others: Prune regularly to encourage bushiness, maintain shape and control shrub size or even to encourage flowering that appear on new shoots. Depending on the vigour and growth habit of the plant type, some may need severe cutting back to about one third of the shrub size or prune a third of the longest woody stems while others just tip pruned. Always use a sharp shear, making a clean angled cut just above a node or eye. Replanting and root pruning is recommended every 3 years when a potted plant becomes root bound. 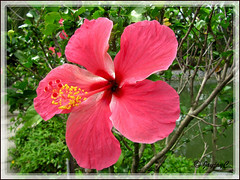 Learn how-to at Hibiscus 101. 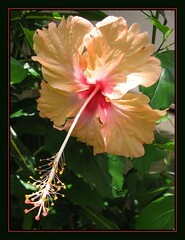 Feed fortnightly as Tropical Hibiscus are vigorous growers. To encourage blooming, choose a fertilizer with contents of nitrogen (N), phosphorus (P) and potassium (K) in medium, low and high amounts respectively. These are measured in numbers as seen on the label of the fertilizer. However, when plants are hard-pruned, feed them initially with a foliage houseplant fertilizer to encourage healthy new stems and subsequently with a flowering fertilizer. 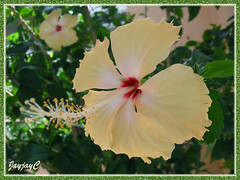 Tropical Hibiscus attracts spider mites that cause yellowing leaves, thrips that cause bud drop, and other garden pests such as mealy bugs, white flies and fungus gnats or shoreflies that can deaden your plants. These can be treated with soapy water, neem tree oil or shower the plant with a strong burst of water with a garden hose. 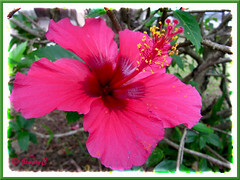 Learn how-to control hibiscus pests at Hidden Valley Hibiscus website. For temperate regions: Hardiness: USDA Zones 9b-11. 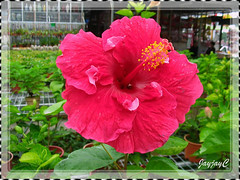 Hibiscus rosa-sinensis are tropical plants that can’t tolerate freezes, but potted and with proper winter protection they can be grown anywhere. 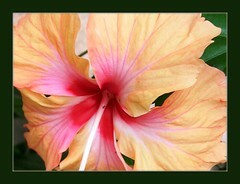 Learn how-to grow them year round in temperate clime at Tropical Hibiscus site. 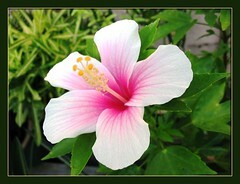 Propagation: The normal method of propagating Hibiscus is by cuttings that root easily within a month or so. Take healthy shoot tip cuttings from current season’s growth or softwood cuttings, the former being most appropriate for an upright single stem if you preferred a standard specimen eventually. It can also be propagated by air-layering, grafting and even raised from seeds. 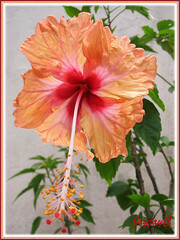 These methods of hibiscus propagation are wonderfully described at Tropical Hibiscus site, with links therein leading you to pictorial illustrations. 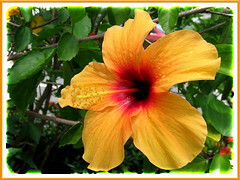 Usage: Nicknamed ‘Queen of the Tropics’, Chinese Hibiscus or Hibiscus rosa-sinensis with such dazzling medley of flower colors is just excellent as an ornamental shrub for landscape plantings, informal hedges, screens or in mixed plantings. It can be easily trained as a standard or espaliered too. Ideal as container plant, especially in freezing areas where it can be easily overwintered indoors in the greenhouse or conservatory, and even simply as a potted houseplant. 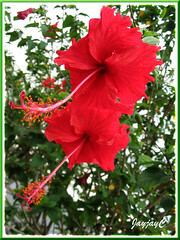 Suitable to be grown along coastal regions as Tropical Hibiscus is salt tolerant. Also, it’s attractive to birds, butterflies and other insects. 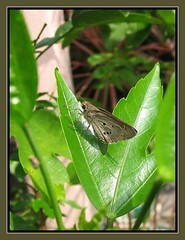 The right image shows a skipper butterfly, Suastus gremius resting on the hibiscus leaf. Besides its ornamental value, H. rosa-sinensis has edible, medicinal and cosmetic uses. Its leaves, flowers and roots are known to contain certain properties that can be used to cure or relieve many ailments while the juice extracted from flowers is used in China as a shoe-blacking polish and cosmetically to darken the eyebrows or as a purple dye for coloring foods. Read details at Plants For A Future. 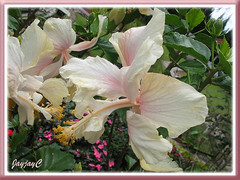 pl.specify the treatment for hibiscus rosasinensis leaf disease having white flies and cottn like patches on the bottom of leaves. Hi Rao! 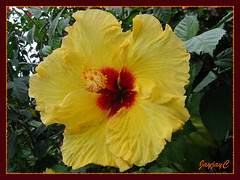 I’ve already provided a useful link in my article above on how-to control hibiscus pests. Why not scroll up to click on it for answers? You flowers , It’s very nice. Thanks, dalia! Yours are very lovely too! Hi R.K.Gupta! 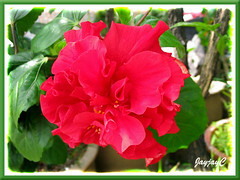 Since Hibiscus is a tropical perennial, it will flower year round in our tropical country, Malaysia where there’s plentiful sunshine, warmth, high humidity and rainfall for its productive growth. If you’re in temperate region, please follow the link we’ve provided at sub-heading ‘For Temperate Regions’ above for further guide. 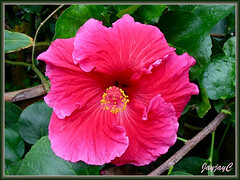 im really fascinated with the color range of “gumamela” thats the common name of hibiscus here in the philippines,but what keeps me distant myself from this plant are pests…. but i had a close encounter with multiple grafting (as many as 10 kinds) in one plant alone this past christmas, this time i really want to try it myself. how could i keep the pests down specially the aphids. other plant i saw in multiple grafts are ixora,codiaeum….